Flu season hits fast and hard. 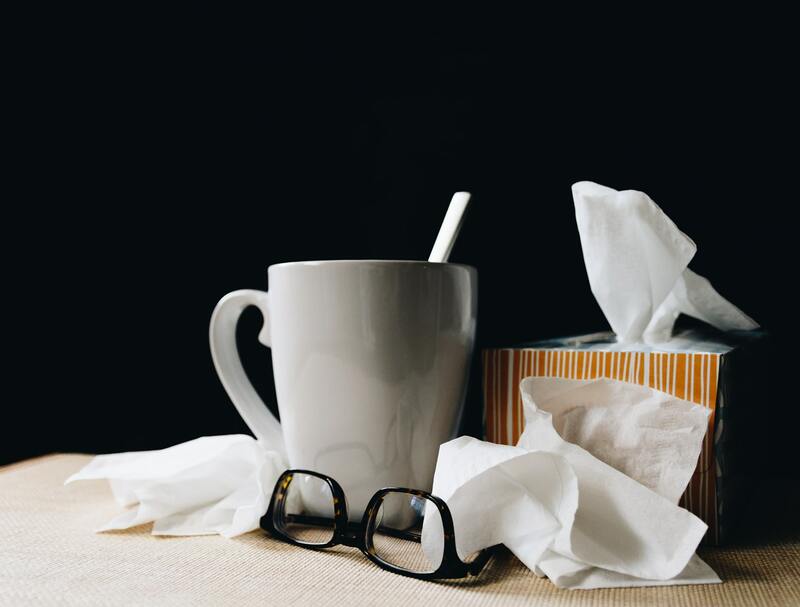 Just as the weather starts to turn from pleasant, warm mornings to freezing evenings, cold and flu viruses begin to wreak havoc. 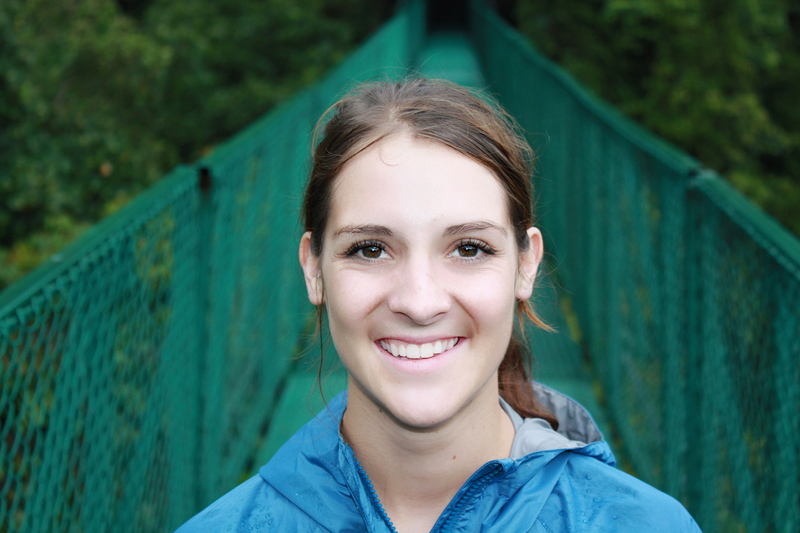 If you've ever had the flu, you know how uncomfortable and difficult symptoms can be. The flu can cause everything from a sore, scratchy throat to wheezing, cough, and nausea. 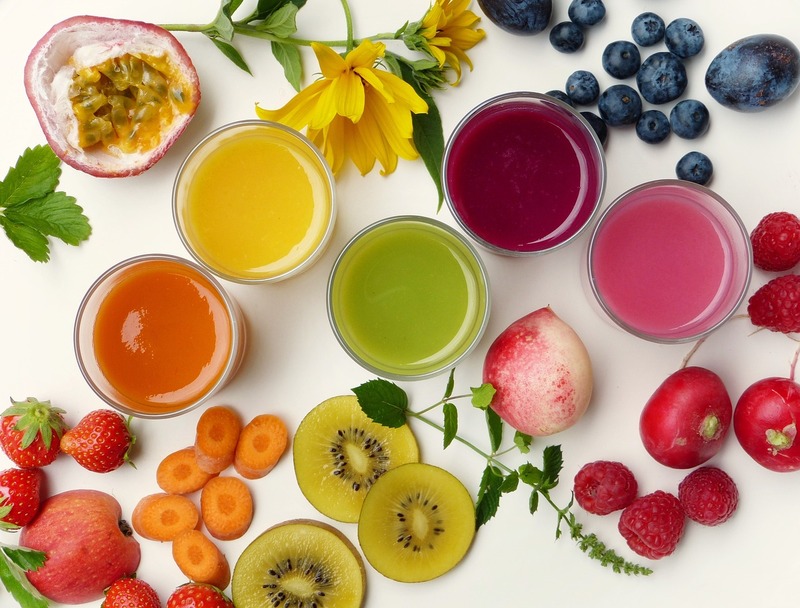 Fortunately, there are natural remedies that can help you beat the flu. Among these herbal remedies, tea is a delicious option for treating and even preventing some of the symptoms of the flu. 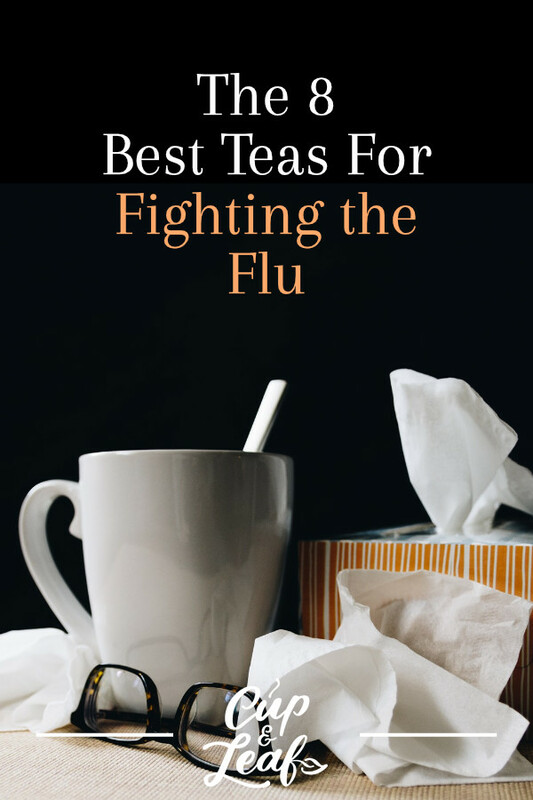 Read on to find the best teas for fighting the flu. Want to get rid of flu symptoms today? Check out our collection of the best teas for beating the flu right here. 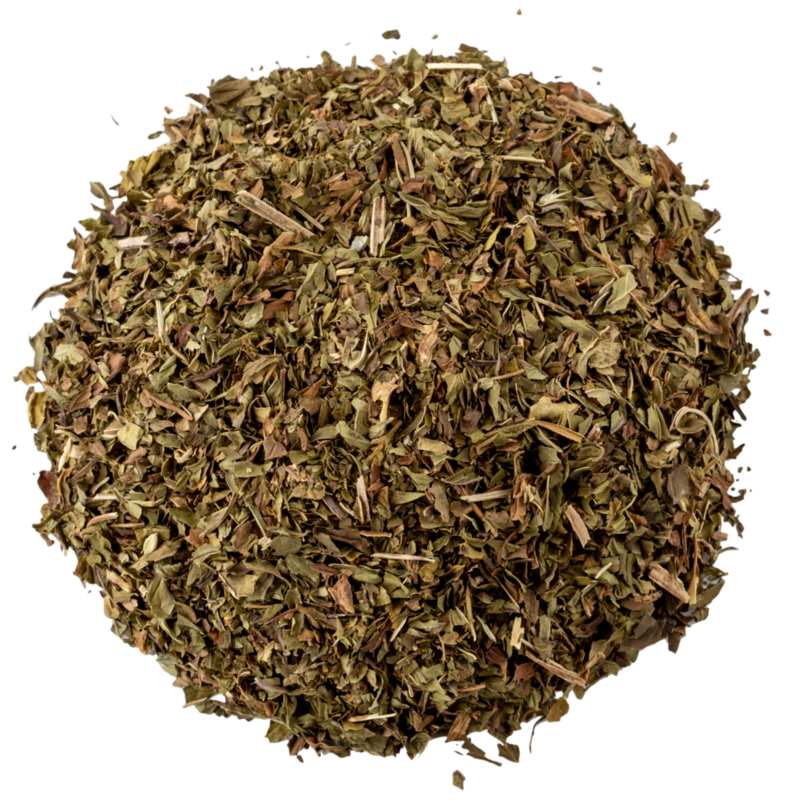 Lemon balm tea is made from the leaves of the European lemon balm plant, which is related to the mint family. Lemon balm tea boasts antiviral and antibacterial properties that help to fight off the flu. A 2016 study found that lemon balm inhibited the replication of the influenza A virus (1). The results were prominent during various phases of the infection, demonstrating that drinking lemon balm tea may help prevent the flu or stop it in its tracks once you've contracted it. A second study published in the Asian Pacific Journal of Tropical Disease found that lemon balm extract significantly diminished concentrations of H1N1 viral cells. The researchers believe the chemical composition of lemon balm helps to inhibit cell reproduction and may induce death in viral cells (2). Another alternative to try is lemon verbena tea. The plants are similar in composition and both offer the healthy benefits of vitamin C that can boost the immune system. 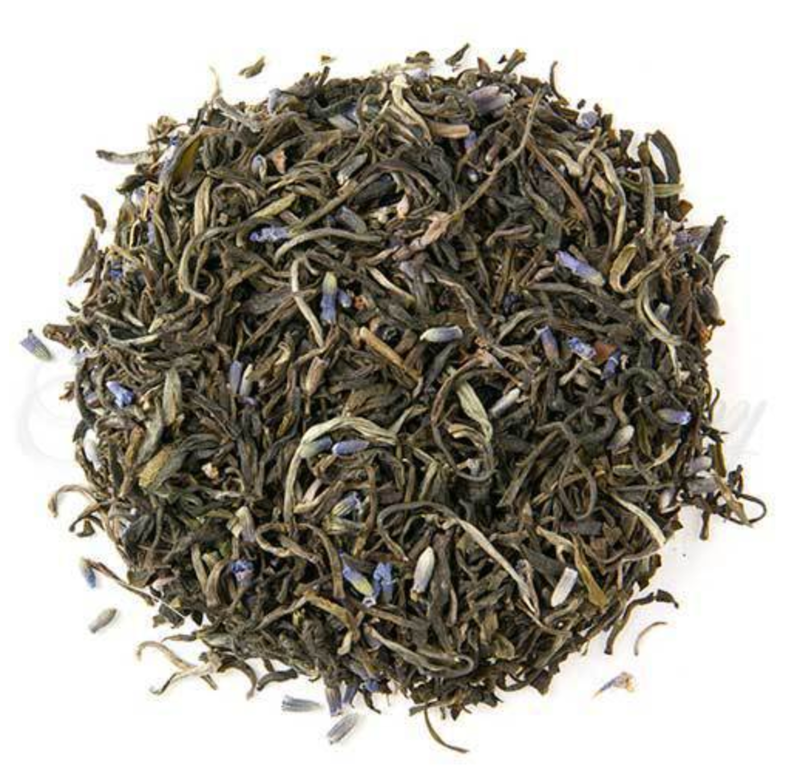 Soothe flu symptoms and get better sleep with our Lavender Green Tea. Green tea boasts extensive health benefits ranging from lower blood pressure to a decreased risk of serious disease. This powerhouse tea is also beneficial when it comes to fighting the common cold and flu. A study published in BioMed Central found that green tea catechins and theanine helped to minimize the risk of contracting flu. The study consisted of 197 participants, 98 of which received a catechin and theanine mixture and 99 who received a placebo. The results showed the catechin and theanine group had significantly lower influenza infection rates. The treatment group also demonstrated a longer period of time between influenza infections compared to placebo (3). 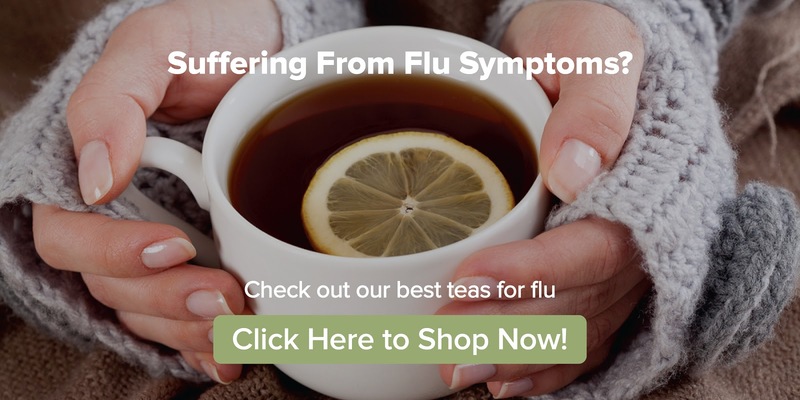 A meta-analysis published in 2018 reviewed the evidence behind green tea's flu prevention properties. Researchers found that green tea catechins such as epigallocatechin gallate (EGCG) inhibit the RNA of viral cells, thus suppressing the spread of the virus. The catechins work to inhibit the interaction of the virus with membranes of healthy cells. Additionally, the research showed that tea polyphenols helped to boost immune health, thus boosting the body's ability to fend off pathogenic bacteria and viruses (4). Ease nausea and vomiting caused by the flu with our Thai Ginger Tea. This herbal tea is made from the root of the ginger plant. 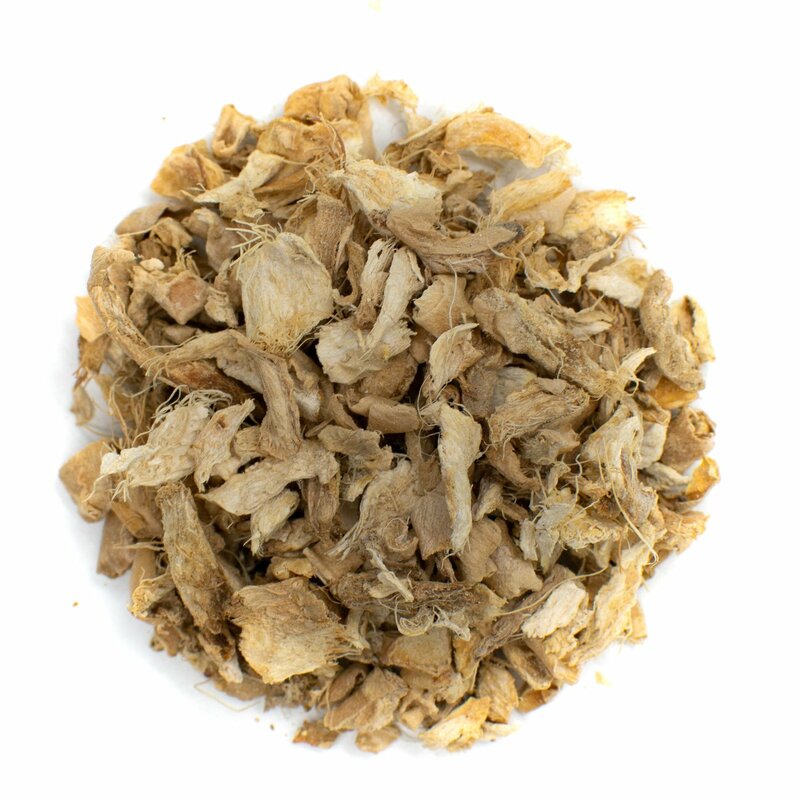 The health benefits of ginger root tea mainly impact the digestive and respiratory systems. Ginger offers anti-inflammatory effects that help to reduce inflammation and swelling that can cause congestion and cough. These properties can also help soothe stomach muscles to reduce symptoms of cramps and nausea. A study published in the Journal of Ethnopharmacology investigated the impacts of fresh ginger on viruses including HRSV—a virus that causes respiratory tract infections. The study showed ginger helped prevent the formation of plaque in the respiratory system, which can result in wheezing and cough. Researchers also found that fresh ginger inhibits viral attachment in cells and stimulates mucosal cells to fight viral infections (5). Ginger's nausea-fighting properties are legendary. The spicy root can be found in herbal supplements, home remedies, and even chewing gum designed to treat motion sickness and morning sickness. The root is so powerful, the National Cancer Institute has commissioned research into its use in treating nausea related to chemotherapy (6). Since nausea and vomiting are often symptoms of the flu, drinking ginger tea can help alleviate these symptoms. Our Ginger-Infused Green Tea helps fight the flu thanks to catechins and anti-inflammatory properties. Combine the benefits of green tea and ginger in one to brew up a flu fighter that will have you feeling back to normal in no time. The combination of green tea and ginger offers immune boosting properties that can build up the body's defenses. The catechins in green tea help to inhibit the replication of the virus while the ginger helps to soothe any symptoms you may already have. To brew this tea, it's best to use hot water, not boiling water. Green tea can develop bitter flavors when brewed at high temperatures. Brew using water between 150 and 170 degrees Fahrenheit. Steep the loose leaf tea and fresh ginger in the water for 2 to 5 minutes. 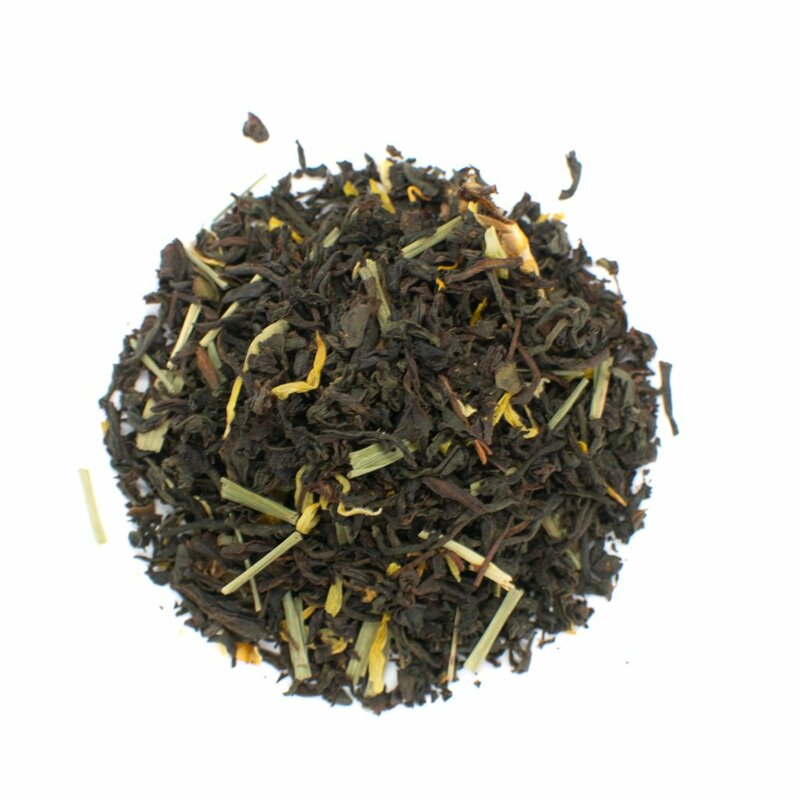 Our Lemon Black Tea has vitamin C and flavonoids that can help the body fight the flu. Black tea is made from the leaves of the Camellia sinensis plant. It has the most caffeine of the true teas, making it a good choice for a morning beverage. The tea leaves are oxidized and dried to create a rich, bold flavor that mimics the taste of coffee. Scientists at Washington University School of Medicine investigated the effects of black tea ingredients on flu viruses. Researchers found that flavonoids in black tea worked in coordination with healthy gut bacteria to prevent influenza infections. Certain types of gut bacteria use flavonoids to boost a molecule known as interferon, which signals the body to boost immune response (7). The study identified a gut microbe called Clostridium orbiscindens as one of the main actors in these health benefits. The microbe metabolizes flavonoids to produce desaminotyrosine, also known as DAT. When researchers gave mice DAT and the infected them with the flu, they demonstrated less lung damage and flu side effects compared to placebo mice (8). Reduce nausea and soothe a sore throat with our Peppermint Tea. 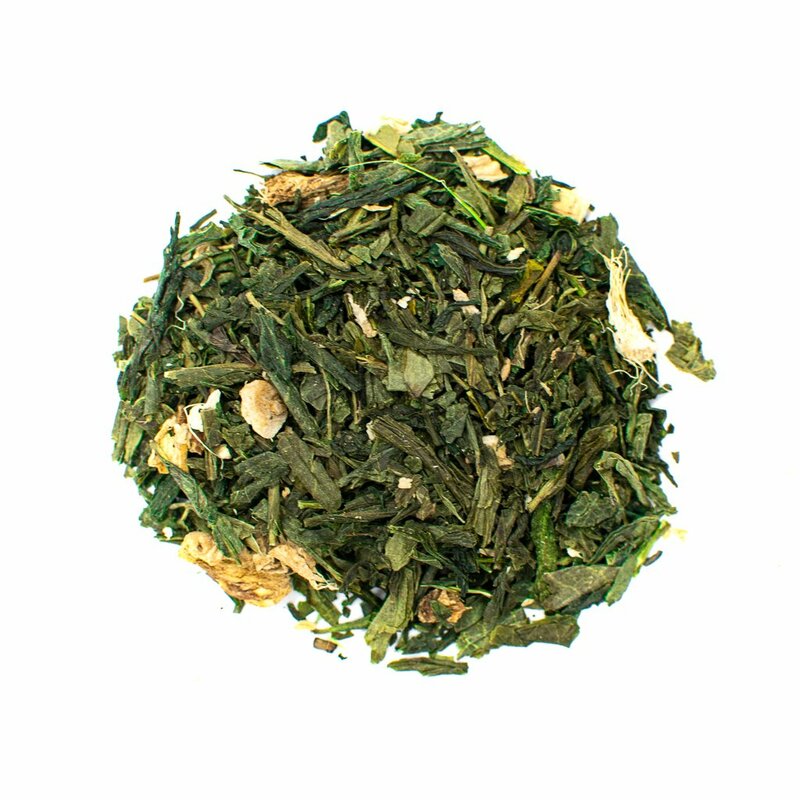 Peppermint tea is a deliciously refreshing tea that boasts a tingling flavor. The tea is made by steeping mint leaves in boiling water. The refreshing aroma can also help clear airways and improve respiratory infections. Research shows that peppermint extract inhibits oral pathogens including the flu (9). This can help prevent the replication of the flu virus, stopping infections in their tracks. Peppermint tea can also help soothe flu symptoms including nausea and vomiting. Pair it with a dash of raw honey to soothe a sore throat and promote better breathing. Echinacea tea is made from the herbaceous flower of the echinacea plant. Some teas can also be made using the roots and leaves of the plant. These plants are commonly found in North America so you can whip up a cup of fresh, flu-fighting tea in a heartbeat. A study published in Pharmaceuticals found that echinacea may help prevent and treat respiratory infections including influenza A and influenza B. Researchers found that echinacea helps to reverse inflammation caused by the flu that results in symptoms including a stuffy nose and sore throat. Scientists also found that certain types of echinacea helped to reduce excessive mucus production and demonstrate virucidal effects on the virus (10). Nettle is a plant many hikers and outdoor enthusiasts are familiar with. The plant features prickly leaves and stems that can be a nightmare in the great outdoors. However, the plant itself can be brewed into a tea that boasts healthy living benefits. This tea can also serve as a potent flu remedy. A study published in ISRN Allergy found that nettle tea boasts benefits when it comes to allergic rhinitis (11). The leaves of the nettle plant contain histamine. Research shows that allergies occur when there are low levels of histamine in the blood. Drinking nettle tea can boost histamine, helping to alleviate symptoms including a runny nose and a constricted chest. In effect, drinking nettle tea can help open up airways that may be impacted by the flu. A second study published in Nutrients found that elderberries helped to reduce symptoms and severity of the cold and flu. The study consisted of 312 airplane passengers traveling internationally from Australia. The randomized, double-blind study found that passengers who received elderberry had a lower incidence of flu and colds and decreased severity in symptoms (12). Combine half a teaspoon of nettle leaves with half a teaspoon of dried elderberries or elder flowers. Alternatively, you can use tea bags if preferred. Steep in boiling water for 3 to 5 minutes. Drink with a dash of raw honey if desired. To protect yourself from the flu, experts recommend receiving a flu shot each year before flu season enters full swing. Get plenty of fluids on a daily basis and wash your hands well to avoid contracting the disease. If you do happen to catch the flu, drinking herbal tea and true teas can help to manage flu symptoms. Theses throat soothers can be paired with cough syrups and other herbal medicines to beat the flu the natural way. With this list of flu-fighting teas, you can help soothe a sore throat, eliminate a runny nose and sinus congestion, and alleviate aches and pains in sore muscles. Pour yourself a cup of tea, get plenty of rest, and you're sure to feel better in no time.